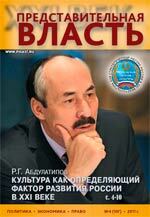 The issue contains reviews of new books: Minchenko S.I. - The content and scope of human rights as a problem; Nevidomy V.I. - Socio-dynamic approach to assessing of the legitimacy of constitutional norms; Altentaller D.N. Formation of the Ruling Party and its Role in Contemporary Russia. Zor’kin Valery Dmitrievich, Chairman of the Constitutional Court Russia. Doctor of Law, Professor, Honoured Lawyer of Russia. Abstract. The article says that huge flow of information going through the Constitutional Court of Russia. Information carefully analyzed by the judges. Russian citizens want continuation of democratic transformation, rule of law, private initiative, ideological and cultural pluralism. But they do not want to talk about all that cover for something else or just the opposite. Abdulatipov Ramazan Gadjimuradovich, Rector of MGUKI, Doctor of Philosophy, Professor, actual and honorary member of several academies of sciences, Chairman of the Council of the Assembly of Russia’s Peoples, Chairman of России, Chairman of the Board of Trustees of the All-Russian Exhibition Center and of the House of Russia’s Peoples. Abstract. In an interview with Ramazan Gadzhimuradovich Abdulatipov, Rector of MGUKI, Doctor of Philosophy, Professor, actual and honorary member of several academies of sciences, Chairman of the Council of the Assembly of Russia’s Peoples, Chairman of России, Chairman of the Board of Trustees of the All-Russian Exhibition Center and of the House of Russia’s Peoples, prizewinner of the Russian Federation in the field of culture in 2010, gives detailed answers to the most urgent and vital questions to every citizen of Russia. Gladikh, Viktor Ivanovich, Doctor of Law, Professor, Honoured Lawyer of Russia. Abstract. The article says that in the penal sense, culture as a whole, as well as its physical media, are one of the objects of the criminal law protection. The Penal Code there are number of articles that include responsibility for the attacks on cultural objects. It is acts such as theft of items of particular value, and smuggling of cultural property, failure to return to the territory of the Russian Federation, items of artistic, historical and archeological heritage of the peoples of the Russian Federation and foreign countries, etc. Truntsevsky Yuri. LL.D., professor, Department of Risk Analysis and Economic Security Financial University under the Government of the Russian Federation. Abstract. While ensuring public security, Russia needs constant improvement of law enforcement measures to prevent encroachments on the rights and freedoms of man and citizen, property and public order. Given the current practices and positive Soviet experience in law enforcement and the organization of prevention work in the modern Russian state and municipal bodies should form a system of measures for the prevention of crime in the sphere of public order in the country, in regions, provide overall guidance to the subjects of law enforcement, public associations and individual citizens and internal affairs agencies to implement such measures within their authority. Political responsibility for the crime and the results of crime prevention, should bear the political party and its leaders. Key words: law, lawmaking, logic, logicality, local government. Abstract. In article it is told about value of logicality of the law and on a problem of an illogicality of modern Russian laws. This problem is considered on an example of the legislation on local government in the Russian Federation. Legislators won't organize professional, independent and fair examination of laws accepted by them and don't analyze results of their action. Minchenko, Sergei Ivanovich, Ph.D. in Law, senior researcher of the National Academy of Internal Affairs of Ukraine. Abstract. The article deals with the analysis of the fundamental human rights’ determining criterial foundations, and also with the reasonability conditions of their officially normativized diapason and the measure of their extension. Nevidomy, V.I., Candidate of Law. Abstract. There’s been proposed a methodological approach, in correspondence with which the dynamics of normative law values, from one hand, and forms of social organization and their functioning, – from another, should be regarded as mutually stimulating co-evolutionary processes. Thus, the relevance with the latter ones defines the legitimacy vectors of a basic law. Anton V. Belyakov, Candidate of Law, deputy of the RF State Duma, Member of the State Duma Committee on the Federal Affairs and Regional Policy, Member of the “Fair Russia” Faction. Abstract. The paper says that EU policy on social protection has alot to do with politics in health care. Over time it was limited tosupport and coordinate measures taken by member states.Tendencies in the development of a single social system in the European Union are discussed in the article. Gennady Petrovich Voronin, President of the All-Russian Quality Organization, Chairman of Committee on Quality of Products of the RF Chamber of Trade and Commerce, Doctor of Technology, Doctor of Economics, Professor; Komarov G.A., Professor of Public Health and Health Training Institute FMBA. Schitova Natalia Gennadievna, a post-graduate student of the Institute of Economics, Management and Law. Abstract: The aricle is dedicated to activities of philantropic organizations in the sphere of Russia's arts & culture, specifics of development of philantropy in Russia, as well as the reasons of shrinking of philantropy in Russia. Among them, the author mentions a number of institutional problems: imperfect legislation, lack of deductions, excessive administrative barriers, etc. The author speaks about the main goals that should be - in her opinion - followed by those who is interested in support of art & culture in our country. Altentaller D.N., Department of Political Science and Political Management Russian Academy of Public Administration under the President of the Russian Federation. Abstract. The article is devoted to the transformation of Russia’s party system. It examines the question of formation of the party of the parliamentary majority and its role. It analyses the trends in further development of the ruling party and unfolds its basic functions and role in state power.